For those of us who focus primarily on Pirate-Core style music, meaning that which bends&blends the pirate genre into new and exciting directions, it’s sometimes important – and refreshing – to revisit the roots of the genre. However, sea shanties as often performed can often come across rather soft and bland compared to the gritty villainy found on more theatrical pirate CDs, which is why the likes of Tugboat Bromberg fill such a nice gap. Tugboat performs what I can only call “minimalist” pirate music – mostly just himself and a guitar. His voice isn’t exactly sinister, but it has just enough scratch to reach a “casually crusty” point that sounds right at home with pirate material. Here There Be Pirates is, I believe, the first of these two albums to have been released. While a live performance, the audio quality is very good and background noise seems virtually nonexistant save for those points where Tugboat or his MC are addressing the crowd directly. The disc begins with a couple of traditional favorites; Santy Anno and Jolly Rovin’ Tar. Both are performed in the traditional manner, although Santy Anno does have a few slightly altered lyrics to make it a little more “piratey.” The Mermaid is third on the CD, although it’s not the same traditional song more commonly found on folk albums – rather, this is a song of a single sailor who falls for a mermaid, and must learn to contend with the fact that while a mermaid is indeed half gorgeous lady, she’s also very much half fish. Here There be Pirates goes on to include several other traditional songs, including Old Dun Cow, Yarmouth Town, and more. The Derelict of course makes an appearance, and Tugboat sings it in a jolly, sinister, catchy manner. The album concludes with a comfy, somber version of Leave Her Johnny, making for a perfect sendoff. 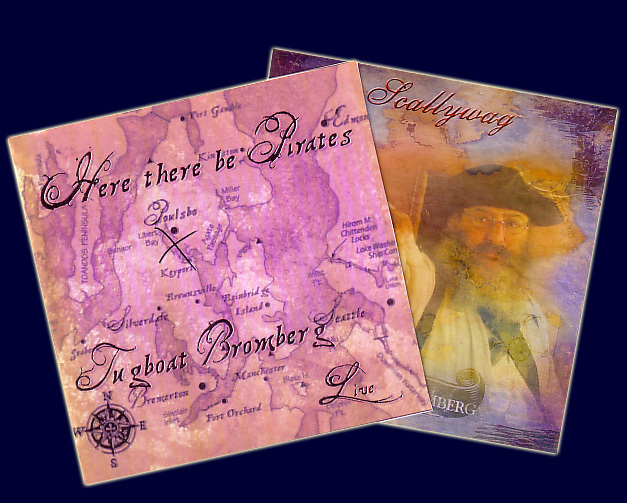 Tugboat Bromberg’s second pirate album, Scallywag, is studio recorded, and seems just a tad sharper for it. It too features a variety of traditional covers, beginning with Jolly Rovin’ Tar and The Mermaid – both were previously featured on the earlier disc, but these are indeed different recordings, and take on a slightly different character thanks to the studio venue. Billy Bones is a cover of a Skip Henderson favorite, and again Tugboat’s scratchy voice does a fine job of capturing this often immitated but seldom duplicated song. The album continues with a number of traditional songs. Bully in the Alley is easy on the ears if a little sober sounding for a song about being plastered. Spanish Ladies has a nicely rough edge to it, and also features an accompanying harmonica (not sure if that’s period, but it’s still a nice touch.) Captain Kidd is one of only two pirate-specific songs on the album (Billy Bones being the other), and it’s an oddly upbeat version considering the somber nature of the lyrics – peppy gallows music. Of the two albums, Here There Be Pirates is definitely my favorite. I don’t often lean towards live albums, but in this case the quality is high and it has just a bit more to offer those of us with pirate-specific tastes. However, fans of crusty shanties shouldn’t discount Scallywag, as it has plenty to offer in its own right. This entry was posted in Music and tagged pirate shanties, tugboat bromberg by Bilgemunky. Bookmark the permalink. I listened to the first couple of tunes on his myspace page and wasn’t really sure if I liked it that much. I’m glad I kept listening, though, because ‘Leave Her Johnny’ is pretty amazing. Thanks for doing the music reviews. I had never heard of Tugboat before and your reviews are a great way to discover new pirate music. Thanks for the review Bilge! I just wanted to let you all know of my new website http://www.tugboatbromberg.com come on by!